Next up in this week's "Wish I'd Thought of That" series: DIY sugar cubes from Nifty Thrifty Things. They're completely adorable, are they not? Learn how to make them right here. It looks fun to try at least once. great link because after stopping by to learn about sugar cubes, I found her post on homemade ginger ale!! Thanks for sharing all of your great finds! Wow, they look so pretty! oh wonderful! !i was looking for something for the tea house! That's awesone. I've seen shaped sugarcubes in shops but they were so incredibly expensive that I never bought them. Need to check it out. Haha. I just noticed: My word verification is "sugarbo". Nice. Adorable! Would be fun for a party with tea or lemonade. When I was a little girl I always said I'd have sugar cubes when I grew up because I thought they were so darling and these most certainly are!! Thanks for the link! totally something i wish i would have thought of. What a cute idea! I love the heart shaped ones! Cute idea! The different shapes would be perfect for a tea party. Farewell to the boring square sugar cube! Love this! i simply adore your blog...is soo fabulous!!! Thank you so much for sharing my project on your blog, Jessica! How cute for a tea party or shower, or even a gift for a tea-loving friend! this is what exactly I what to learn, thanks. 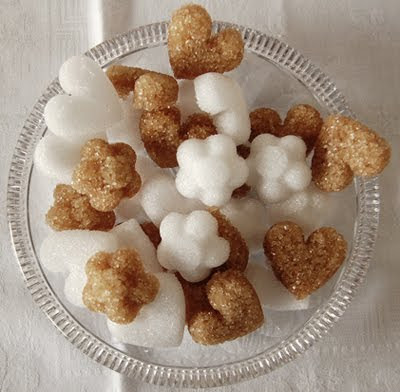 Thanks for this post (and link) on creating your own sugar cubes. They look quite adorable.